Just because felting is so much fun!!! I made a felted bead for B to wear. She loves unique necklaces and is always raiding my Phat Box for buttons and stitch markers to convert. I made this one for her. She loves it! 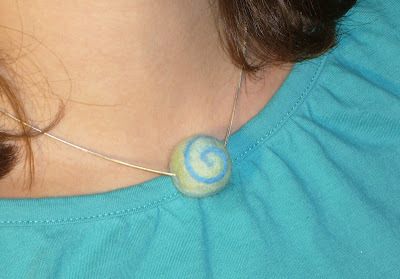 I felted this bead from some miscellaneous brown fleece that I have kicking around. Once I was please with the shape, I covered it with the pale green and felted it quite firmly. Adding the swirl was fun and I knew B would love it. To make a hole for the chain, I stabbed successively larger dpns through the bead, beginning with a 2mm and ending with a 6mm. It seems to work quite well! There would be more felting, but I'm under a deadline for secret knitting. It takes precedence unless I'm getting so bored with it that I'm in danger of stabbing myself with my dpns to end the monotony of project monogamy. There is also Christmas knitting waiting in the wings that has to be done before I abandon all caution and needle felt to the exclusion of all else. It's lovely and quaint and chic.